How ironic and of course hypocritical that the man who will likely be the undoing of America’s military would take a moment to honor those who fought for the honor that will bestowed up him in just a few short hours. The gesture of the visit would mean something, if it were truly more than just a photo op and propaganda ploy for the most anti-military soon-to-be president in America’s history. In his heart Obama sees the fallen war heroes of America as oppressors. They are the “…raiders of villages and killers of innocent women and children.” Such is how liberals in general view America’s participation in protecting the rights of others, and only asking for enough soil to bury our dead. Never in the history of civilization has a country with so much might, taken so little. American soldiers are liberators, and not oppressors. But you can’t get our soon-to-be new Commander-in-Chief to say this publicly. There is no photo op in that belief…no confetti in that future. Obama stood on the hallowed grounds of Arlington National Cemetery, hand over his heart, as the bugler played “Taps.” How fitting, I thought, because the Obama administration has the potential to play “Taps” for America’s military dominance, and “Taps” for America as the beacon for civilization as a whole. This is how true Conservatives know America to be, and not what the mainstream media wants us to think. 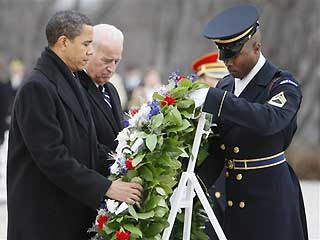 I know that Obama did what any president-elect would do in visiting Arlington National Cemetery. But I contend, that he would have visited an Al Qaeda cemetery had it been along the route. You know, in an effort to be fair. So what are his plans for America’s military? He wants to set up a civilian equivalent of the military. Here’s a bulletin: Such an organization can never exist, because civilians can’t do what our military men and women do! And it’s an insult to think otherwise. Further we already have the National Guard, and this organization has served us well, in peace time and in war, and that is all we need. Obama has said that he will revoke “Don’t ask, don’t tell“. Now I am not naïve enough to believe that there were no gays in the military in the past. But the system worked. The military is not there for some social engineer experimentation. Liberals are doing enough of that in the civilian world. Obama is ushering in a kindler, gentler era for the interrogation of terrorists. They now have the same rights are any America, despite the fact that they want us annihilated. So terrorists will no longer be waterboarded, even if it were to save countless American lives. I wonder what his take on this would be, if it were his daughters in danger? Good news for us Americans is I can guarantee you there are patriots in this country who will tell Obama and any other liberal to kiss their butts, as they beat the crap out of somebody who could do us harm. I am happy to know a few such patriots. Finally, Obama wants to shut down GITMO, for no other reason than he needs to throw a little raw meat to the pacifists. Where else are we to keep enemy combatants? Oh, my bad, there are no longer any terrorists or nor is there torture. Let’s just give them their day in court, paid for by the American taxpayer; don’t worry, we can bear it. And when they are released on a technicality, just let them be free inside our country, with no traceability. I feel safer already, how about you? Of course the media has already ordained Obama “the smartest guy in the room” no matter the subject matter. The fact that he knows nothing about the military, military history, military policies or procedures doesn’t detract from his ability to “social engineer” the only institution of the government that actually works. I’d like to see him make better use of his time…maybe just make speeches? It has been told to me, that Marines who stand at the steps of Air Force One hold their salutes extra long when George W. Bush exits the plane. This gesture is the ultimate sign of respect for a Commander in Chief. For Clinton however, they ended their salutes abruptly, even before his back was to them, as a sign of disrespect. This gesture is second only to turning one’s back to a ranking officer or not saluting at all. I’m sure that the ghosts of many of our fallen heroes rose to take a look at the man who could benefit so much from their sacrifices, yet care so little for the cause of freedom. That the ideals for which they fought so hard could be so callously and carelessly disregarded. I suspect that the ghosts of those American heroes at Arlington National Cemetery rose from their graves to meet the Liberal’s Messiah, each turning their backs on him as he passed their grave markers.